Kim Kerry-Tyerman is a volunteer for Grameen Foundation’s Bankers without Borders® initiative, based in Ghana and Kenya for eight weeks to help the BwB team develop relationships with local organizations (companies, associations, microfinance clubs and institutions of higher education) there. She recently posted a blog about her experience working with another BwB volunteer on behalf of Grameen Ghana, helping to implement a financial-modeling approach by Grameen Foundation that we hope to replicate at microfinance institutions (MFIs) throughout the world; an excerpt from that post is below, with a link to the full post. If you’d like to read her first posting about her BwB experience in Ghana, you can find it here. I’ve been counting down the days to this. Not that thunderstorms, tigernut cocktails and weekend stays at oceanside eco lodges haven’t kept me busy – my stay in Ghana has been a fascinating combination of experiences both new (opening a coconut with a machete) and surprisingly normal (watching too many episodes of “The New Adventures of Old Christine” while dogsitting for a friend). But I’m not here just to drive around with locals to chop bars with dancehall music blaring out the open windows to join in the cacophony of Accra streets. Certainly part of the fun, but not the goal. I’ve been talking up the Bankers without Borders program to MFIs across Accra, and this is finally my chance to watch it in action. Grameen Foundation asked me to shadow a BwB project for a partner MFI called Grameen Ghana in the northern city of Tamale (surprisingly no affiliation despite the shared namesake). A volunteer from an investment bank in NYC, Noah, is delivering training on a new financial model over a 4-day assignment. This is only the second time this Grameen Foundation model has been passed on to another MFI, but BwB hopes this will eventually lead to a standard for financial projections across the industry. 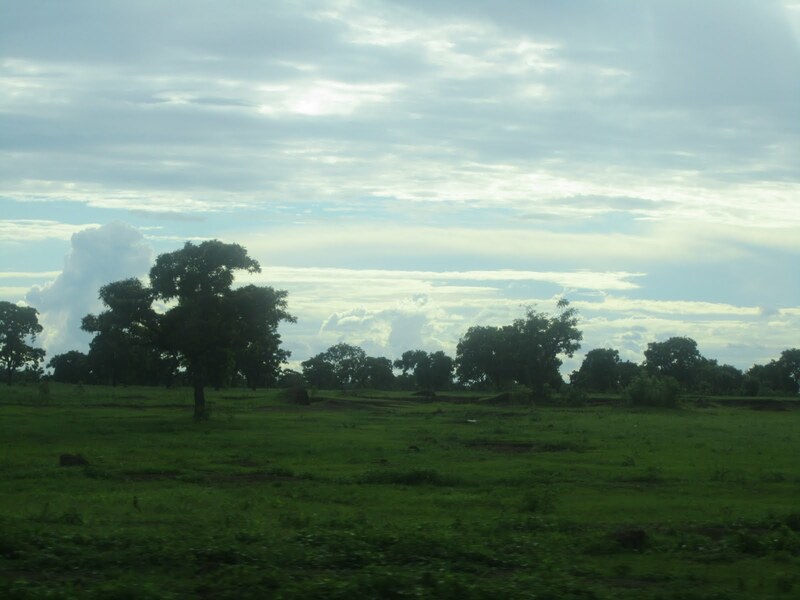 On the road to Tamale, Ghana. My role on the project varies depending on who you talk to. BwB would like me to evaluate the project from both volunteer and client perspectives with an objective third eye. Not having a chance to introduce myself during the kick-off meeting with the MFI, however, gave the director the opportunity to task me with a different role. “And Noah has brought this pretty woman,” he announced to the team, “so everything we do will be prettier.” Challenge accepted. Kim Kerry-Tyerman is a volunteer for Grameen Foundation’s Bankers without Borders® initiative, based in Ghana and Kenya for eight weeks to help the BwB team develop relationships with local organizations (companies, associations, microfinance clubs and institutions of higher education) there. A graduate student in public policy at Mills College in Oakland, CA, Kim is a former AmeriCorps VISTA fellow, where she researched strategic volunteerism at the Taproot Foundation. She has dual citizenship in the US and the UK, and has volunteered on several community development projects throughout England, Eastern Europe and Africa. She says her hobbies include daydreaming, playing tennis and drinking beer. Ghana moves slowly. Meals at restaurants can take an hour to arrive and the mud sidewalks are crowded with ambling pedestrians who stop to chat frequently. Last night a friend told me about checking in on an item he had ordered from a vendor; when he asked when it would be ready, the response was, “for sure maybe tomorrow.” This is at once the most wonderful and most frustrating characteristic of Ghanaian life. Something I really wanted to do on this trip was meet at least one microfinance client to see for myself if a small loan really made a tangible difference. Recognizing the sluggish speed of life and acknowledging my short time here, I wasn’t too optimistic that I’d get the opportunity. But as those who have come to know Ghana understand, things have a way of working out in ways you can’t anticipate. 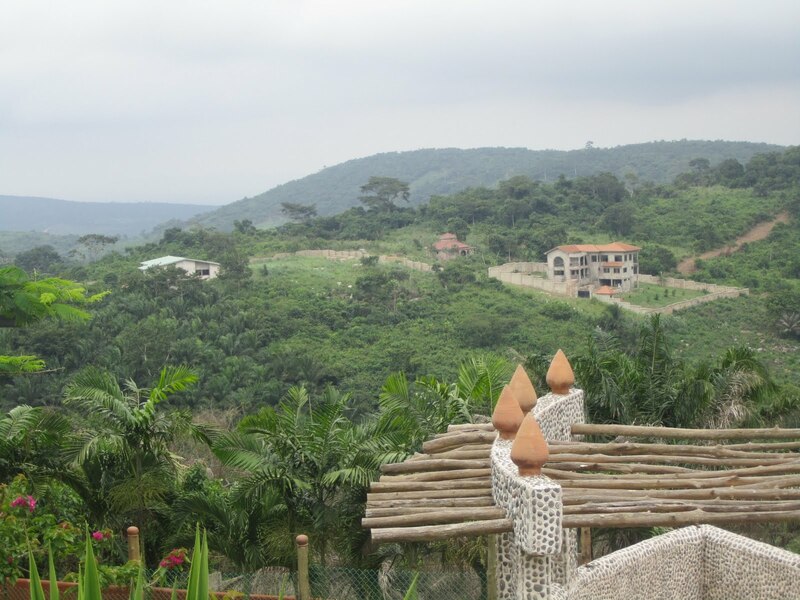 The view from Hillburi, Aburi, Ghana. The first MFI I met with last week was impressive from the moment I entered the office. I did not expect them to be in a five-story office building with glass walls and cubicles, nor did I think that my flip flops and sundress would render me embarrassingly underdressed. A team of three men in sharp suits, including the CEO, ran me through a well-prepared Powerpoint on their background and operations. They base their banking on mobility; that is, their loan officers each have a mobile phone and a mobile printer through which they can serve hundreds of customers in remote villages throughout their target regions. Customers receive a printed receipt while their information is sent from the phone back to an impressive information management system (that the company developed internally) so that the head offices can keep track of individual balances, outstanding loans, and agent collections. This model is limitless, especially in terms of reaching customers in remote areas who lack access to financial services the most. After an hour or so I thanked them for their time, and left the meeting more than satisfied. Lynda Barton is spending six months volunteering with MOTECH Ghana through Grameen Foundation’s global volunteer corps, Bankers without Borders. This is Part II of a two-part series. If you haven’t yet, you can read part 1. 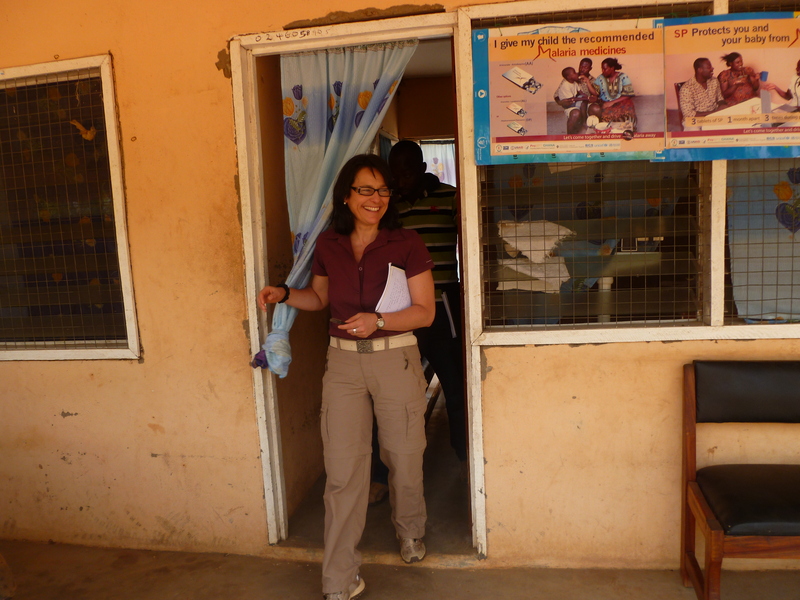 I’m in my fourth week now and have had the opportunity to visit our field sites in the Upper East Region of Ghana to see Grameen Foundation’s Mobile Technology for Community Health (MOTECH) initiative in action. These are some of the most remote areas in Ghana, where MOTECH really makes a difference for expecting mothers. We visited 12 facilities during my three days in the field, interviewing nurses and midwives at each location to collect their feedback regarding “Mobile Midwife,” the MOTECH mobile application that they have been using. I was absolutely humbled by the dedication of these nurses and midwives and how they manage to work with so few resources available to them. One of their greatest concerns is their fuel allotment for the month. If they have too many follow-ups at patients’ homes for that month they run out of fuel and can’t afford to do more visits — not to mention the long hours they must put in to finish the paperwork that is required at the end of each month. Most of these nurses and midwives work very long hours and weekends. MOTECH and the efficiencies it provides should help them in the future, if all of their client data can be uploaded electronically via the mobile phone application, because their paper registers will no longer be needed. 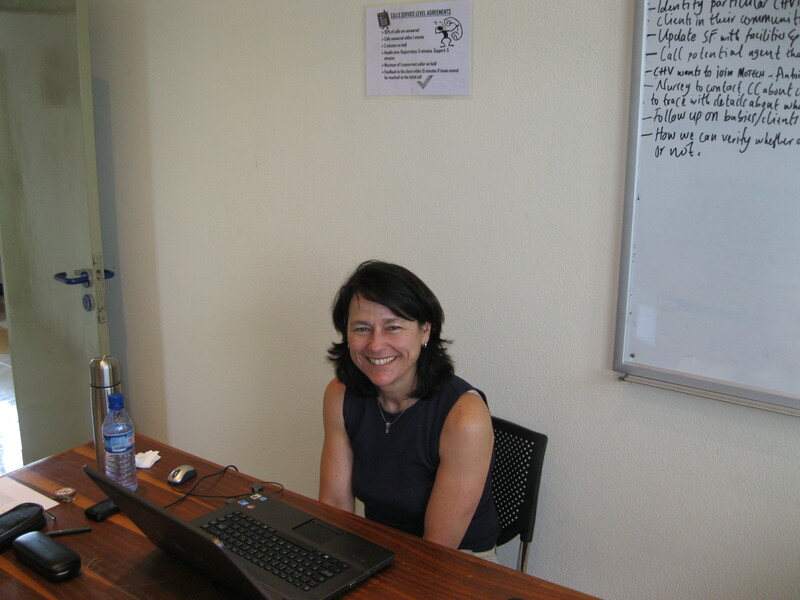 Lynda working in Grameen Foundation's Ghana office. This project is amazing since no two days are the same and I’m able to contribute to so many different things. Day two in the field was mostly devoted to shooting video footage of expectant mothers who are using the Mobile Midwife application, asking them about their experience and how it has helped them so far during their pregnancy. We interviewed one mother’s husband, who was impressed with the program and often listens to the voice messages his wife receives as part of the program. He especially likes the messages that tell her to eat meat and eggs, those that tell her not to carry heavy things, and the reminders for vaccinations and check-up appointments; he ensures that she never misses an appointment (for some, the distances to the clinic are significant, so this is not always an easy task). It was so interesting to meet some of these ladies and their families and listen to them speaking in their local dialect. Volunteering is not only an opportunity to broaden my horizons on a professional level. It has also given me an opportunity to meet new people, see new places and learn about different cultures. I’ve tried to do as much as possible — in and out of the office — and Ghana has impressed me with its welcoming people and interesting places to visit. So far, I’ve managed to join a book club, meet new volunteers, make friends with other locals and expats, visit the Aburi Botanical Gardens, get to know a few restaurants and bars in Accra, and visit the Cape Coast and Kakum National Forest, to do the canopy walk. I know there’s a lot more exciting work to come – stay tuned! Lynda Barton is spending six months volunteering with MOTECH Ghana through Grameen Foundation’s global volunteer corps, Bankers without Borders. This is Part I of a two-part series. It’s amazing to realize that you can completely change your life in fewer than 30 days when you have the passion and motivation to do so. We often set our own limitations and roadblocks, but I think we can achieve anything we set our mind to. We might just need some patience and flexibility along the way, but once you take that first brave step, a whole new world opens up to you. Perhaps like many other volunteers, I found the first step difficult, but I have not looked back since. Lynda Barton is volunteering with MOTECH through Grameen Foundation's Bankers without Borders program. For years I’ve been interested in healthcare and microfinance, and the potential benefits that such initiatives can bring to the developing world. I’ve researched a number of organizations, in the hope of someday gaining first-hand knowledge by working with them in the field. Grameen Foundation really impressed me with its healthcare-related initiatives around the globe. Given an incredible opportunity to help with one of Grameen Foundation’s projects in Ghana, I took a courageous step in January and requested a nine-month leave of absence from the pharmaceutical company I had worked for in Switzerland since 2000. I was excited and terrified to take such a risk professionally, but I knew in my heart that I was doing the right thing for me. I also knew that that the experience I’d gain clearly outweighed the perceived risks. I was in the Ghana office by March 9th learning about Grameen Foundation’s Mobile Technology for Community Health (MOTECH) initiative, which uses innovative mobile phone-based solutions to help provide healthcare access to pregnant and new mothers in rural communities in Ghana. It’s an exciting project and the team is very busy planning an expansion of its pilot program, to eventually scale up to the national level (pending funding). I’m still getting up to speed with the details, but have been learning about the applications they use to capture client health data, as well as learning about the system for alerting clients about upcoming vaccinations and check-ups. The application/tool also delivers tips and useful health information to registered users. I feel very privileged to be helping this unique and talented group of people to accomplish such a sizeable task. I was expecting the pace to be slower than the office environment I left in Basel, but people here are really motivated by the project, and are often in the office beyond their scheduled workday. Only two weeks into the assignment, I had the privilege of meeting the President and CEO of Grameen Foundation, Alex Counts, who visited our site to see our work first-hand. He was accompanied by David Edelstein, Director of the Grameen Foundation Technology Center, and Robyn MacIntire, Grameen Foundation’s Regional Director of Development. It was a wonderful opportunity for our entire team to meet these individuals and to learn more about the vision and passion that drives the company. We were all very inspired by their visit. Eric Cantor has led Grameen Foundation’s AppLab efforts in Uganda for the past three years, and continues to serve as an advisor on the project. 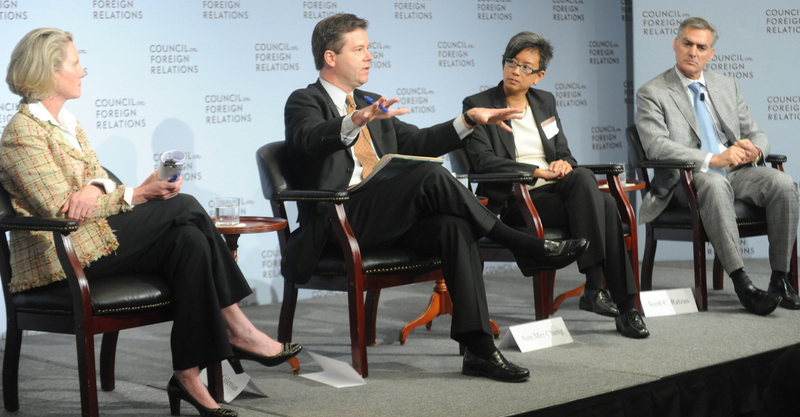 Grameen Foundation takes outcome measurement seriously. We want to make sure that our programs and services are effective, and that we can demonstrate their benefits before implementing programs or practices on a wider scale or urging others to replicate them. With this in mind, we recently completed one of the first randomized control trials designed to assess the impact of a mobile phone-driven health service aimed at improving the lives of the poor. The service we sought to measure was Health Tips, part of the Google SMS suite launched throughout Uganda in 2009 with our partners Google and MTN Uganda. Our social impact partner Innovations for Poverty Action (IPA) performed the study. Preliminary findings from the study are substantial, supporting some of our initial hypotheses and refuting others, and informing our approach to building pro-poor, mobile phone-driven solutions going forward. In short, findings indicated that when people learn of such services, they use them. People also seem to learn from this particular text-message query-based product. But we also found that, because of the limitations of human motivation and barriers like language and literacy, we have a lot more work to do. The Health Tips study was conducted in Uganda over an 18-month period. 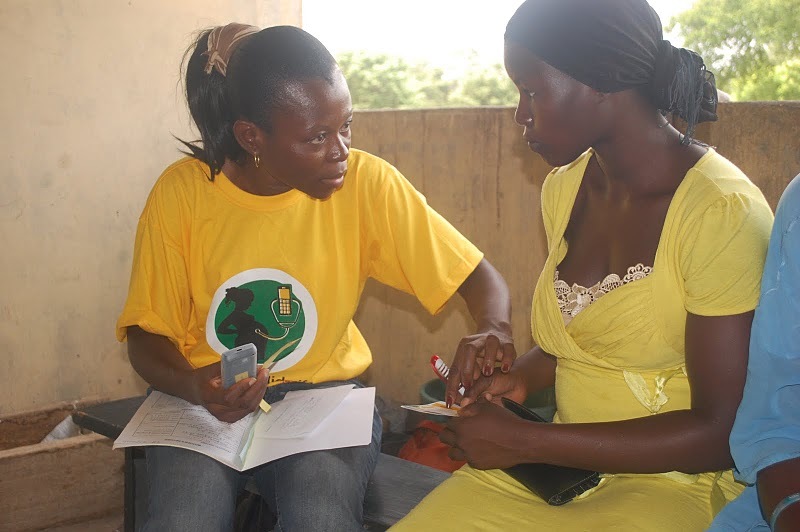 Before the launch of Google SMS in June 2009, IPA conducted a baseline survey of 1,800 people in 60 rural communities, assessing demographic profiles, attitudes, and knowledge and behavior regarding sexual and reproductive health, and collecting data from local clinics. When we launched the service, we initiated a marketing campaign that randomly targeted half of those communities (the “treatment” areas) and did not reach the other half (the “control” areas). 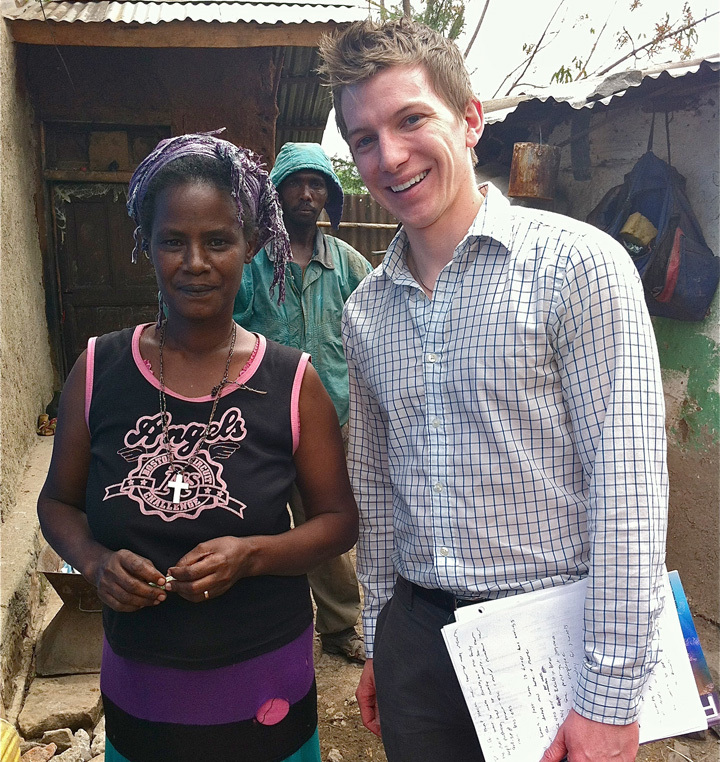 Our studies have shown the value of "trusted intermediaries" -- such as the Mobile Midwife counselor in the photo above -- as a way to make mobile phone-based communications to the poor more effective. Through randomization, IPA chose two sets of communities that were uniform in every relevant respect – except that one was exposed to the product through targeted marketing campaigns, while the other was not. Nine months later, they began a follow-up survey of 2,400 people to detect changes. They looked at data from surrounding clinics, conducted qualitative interviews and assessed the information provided to the communities. Because the targeted marketing in treatment villages was effective – we saw more than four times as much usage in the treatment areas as in the control – we were able to assess the effect of the service on attitudes, knowledge and behavior relating to sexual and reproductive health.